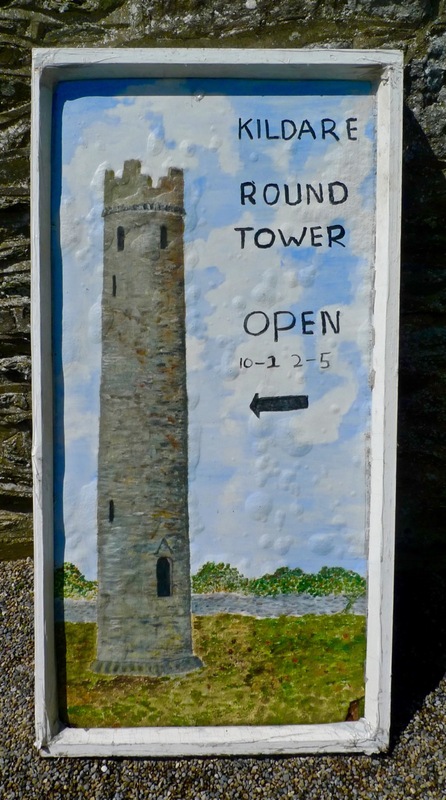 If you suffer from vertigo or claustrophobia – or both – then you won’t want to follow us in the adventure we had this week while returning from a visit to Dublin: climbing to the top of an Irish Round Tower! Overcoming any tendencies we might have had towards these phobias, we arrived at the roof of the 32.6 metre high Kildare tower and marvelled at being able to stand on the summit of a piece of architecture over a thousand years old. 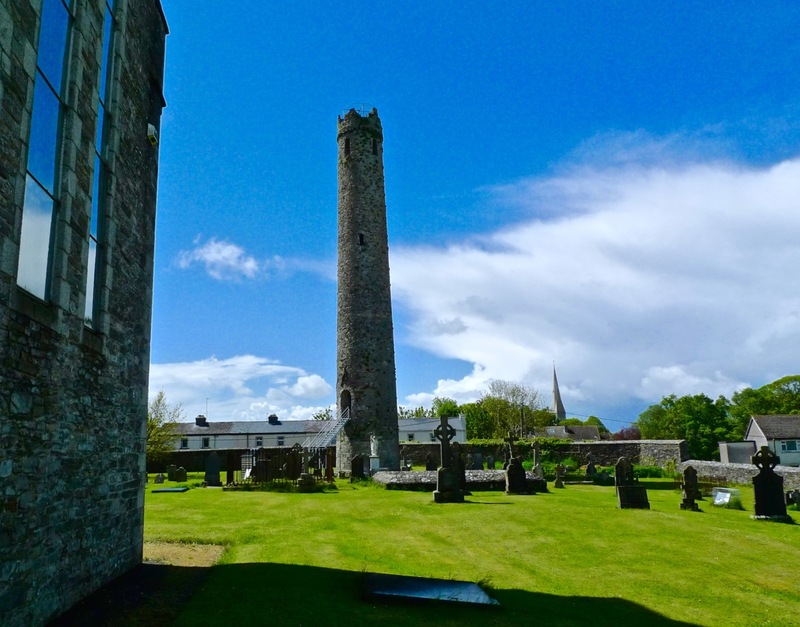 Kildare has the second highest Round Tower still extant in Ireland: the highest is at Kilmacduagh, Co Galway, at 34.9 metres; however, Kildare now lacks a conical cap, which it might once have had. If so, it would just tip in as the highest of all the towers. 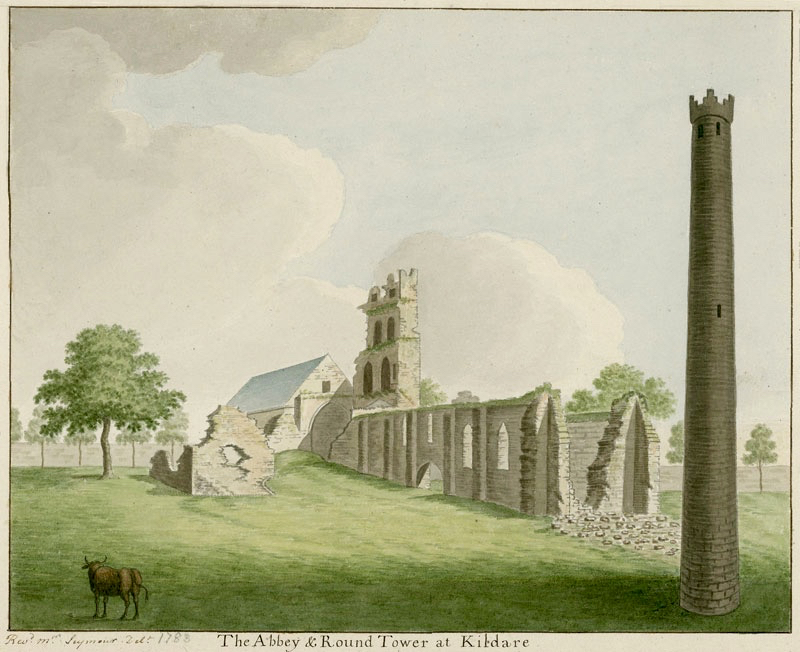 The print above – dating from 1788 – shows the ruins of St Brigid’s Church, which was fully restored as a Church of Ireland Cathedral a hundred years later. We looked down on this from our vantage point atop the Tower – and had a good view of the (also restored) Fire Temple where a perpetual flame, lit by the Saint, was kept burning for hundreds of years, finally being extinguished by the shenanigans of Henry VIII. You’ll have heard me talk about St Brigid many times: she’s second only to St Patrick in the Irish Martyrology. In fact, as probably the most influential woman in Irish history, I’m going to declare her as quite the equal of St Patrick: she’s often enough described as one of the Patron Saints of Ireland. You will also know that she is surrounded by folklore and traditional customs, such as the making of her Cross on her day, the First of February. Back to the adventure (although the whole day was adventurous!) – climbing the tower was hard going. There were a series of near-vertical ladders to be negotiated: each one took us to a higher timber platform, six floors in all. At the top of each ladder we had to squeeze ourselves through a narrow opening; this, and the confines of the tower interior – only two metres or so across – certainly challenged the claustrophobiac in me. The restricted space also made us question some of the theories about the uses of these towers, which are always located at ecclesiastical sites. The definitive work on them is, as it happens, written by someone who also lives in West Cork – just a little distance from Nead an Iolair: Brian Lalor. Brian has led a very full life, involving architecture, archaeology, sketching and printing (his etchings are exquisite). 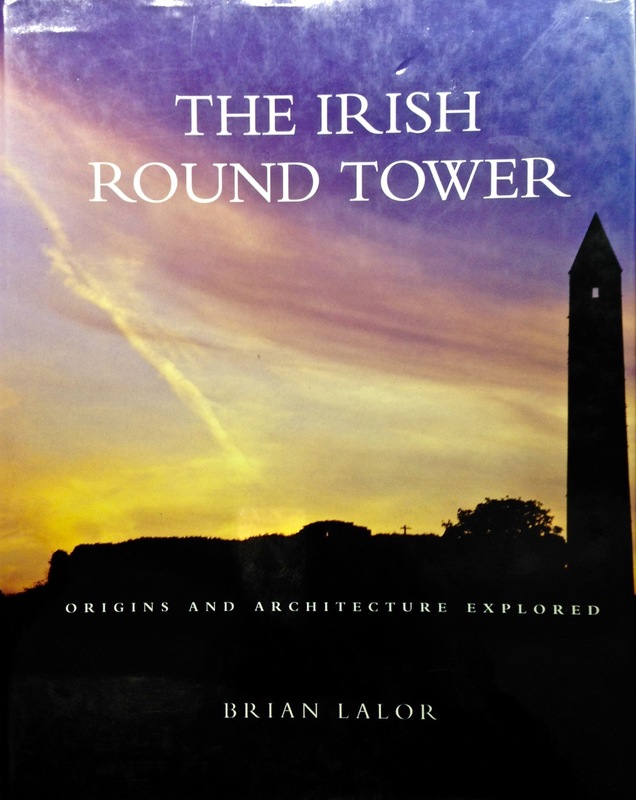 He is also the author of a number of books, many of which are on our own shelves, including The Irish Round Tower, published by The Collins Press, 1999 and 2005. Brian is unequivocal in his assertion that the primary purpose for round towers was to house the monastery bell. He also suggests that a secondary function would be as a safe storage place for the monastic treasures: the entrance door was always raised at a considerable height above the surrounding ground level, requiring steps or a ladder to gain access. In the times when they were constructed they would have been visually impressive – and could be seen from a great distance. 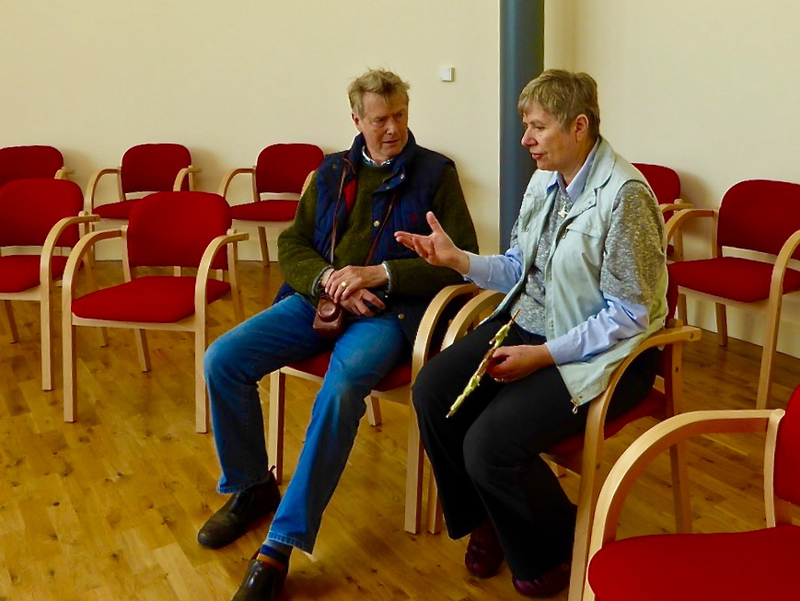 They would have acted as signposts for travellers who might have been searching for the hospitality which monastic communities always offered. Brian discounts some of the more bizarre theories for the towers – for example, that they might have been places of safe refuge for the monks if under threat of attack by Vikings – or that they are simply phallic symbols! Lastly, Brian considers – and gives some credence to – the idea that the towers were monumental buildings of prestige and local aristocratic patronage: certainly, they required considerable expense and effort to construct. As is often the case with our days out, one adventure led on to another. 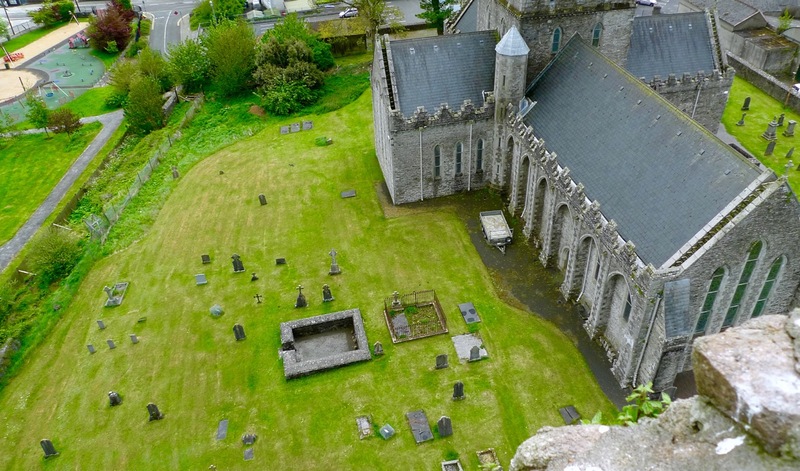 When we came down from the tower we found that St Brigid’s Cathedral had closed for lunch. But we knew that the Saint’s trail also involved a Holy Well and we had heard that there was a new building devoted to the work of Brigid just outside Kildare. 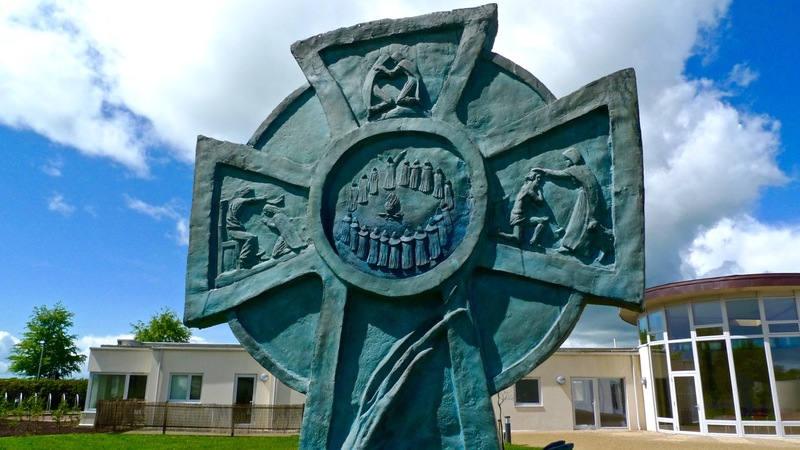 We were very impressed with the Solas Bhríde Centre: a small group of Brigidine Sisters has put together the project to build a Christian Spirituality Centre which unfolds the legacy of St Brigid and shows that it is still relevant in the present day. We were shown around the Centre by one of these Sisters, Phil, who pointed out that Brigid was attuned to the natural world and would have appreciated that the new building (designed by Solearth Ecological Architecture) is conceived on ecologically sound terms using sustainable materials and techniques which care for the wellbeing of the Earth. 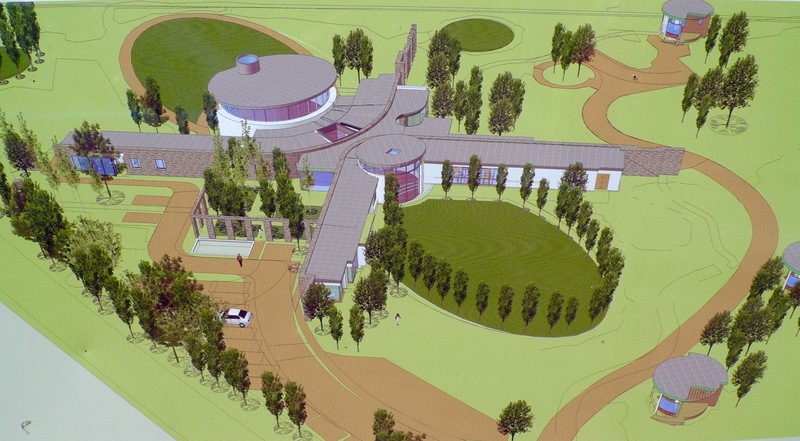 The plan of the building is appropriately inspired by the shape of a St Brigid’s Cross. Finally, we arrived back at the Cathedral. I’m always a little disappointed by restorations – particularly those which were carried out in Victorian times; nevertheless there are some impressive features. The possibly twelfth century font is one of them (below left), and another has to be the hidden Sheelagh-na-gig under the lip of Bishop Wellesley’s tomb (below right). I reached under to feel this little carving, and was then told by the Cathedral’s guardian that anyone who touches the effigy is ensured everlasting fertility! This entry was posted in Archaeology, Architecture, West Cork Blog and tagged Bishop Wellesley's Tomb, Brian Lalor, Brigidine Sisters, Holy well, Irish Round Towers, Kildare, Kildare Heritage Centre, Kildare Round Tower, Round Tower, Sheelagh-na-gig, Solas Bhride Centre, Solearth Ecological Architecture, St Brigid, St Brigid's Cathedral, St Brigid's Cross, St Brigid's Day, St Brigid's Holy Well. Bookmark the permalink. The round tower at Grangefertagh sits just behind our ancestral home. The Ryan’s of The Steeple have lived in its shadow for 2 hundred years! It is magnificent and mesmerizing. When you are in the house and the looming presence hulks just outside, it seems alive to me. I was there for the Millenium and ran out early morning Jan 1, 2000 to lay claim to being the first person to touch it in its 3rd millennial of existence. As an American, my jaw dropped the first time I visited that these remarkable historic ruins were so casually sitting in the backyard. My great grandparents and many other relations lay slumbering in eternal sleep in its graveyard as well. I only recently discovered your blog and I am enjoying it’s eclectic mix of subjects! Have you ever read Peter Harbison’s interesting book “Pilgrimage in Ireland”? He suggests Round Towers were always associated with early Irish Christian sites of pilgrimage and may have been based on very similar pilgrimage related towers that once stood in Jerusalem, Antioch and Rome! Thank you Michael. It’s Robert replying as the blog was mine! We each publish a post every week: you can no longer see whose is which, but it’s good to guess… Brian Lalor is very definite that the towers are bell towers, as they are described ‘cloig teach’ in the contemporary annals: that translates as ‘bell house’. Nevertheless, there continue to be many theories (some most bizarre) as to the reasons for them. They certainly attract the eye and make you want to visit them – we are constantly coming across them in our travels. Sounds like fun. We’d climb that! What a great bit of exploration – the final ascent in the round tower looked a bit challenging! And, I love that holy well – something very peaceful about it. Shame that Brian wrecks that image of merry monks emptying chamber pots on Vikings from the safety of the high tower having withdrawn the ladder 😦 I once started up the round tower in Kilkenny but thought better of it half way up.